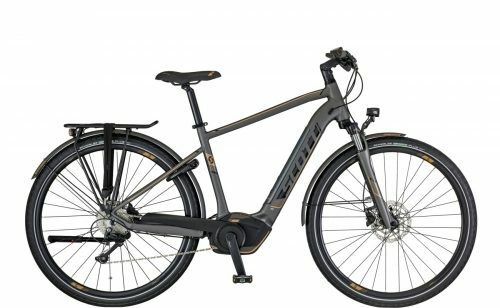 The SCOTT E-SUB Sport 20 Men is a rugged touring electric bike, designed for leisure or commutes. With greatest appeal to gentlemen, the Sport 20 from SCOTT is a tough and reliable performer. Strong, robust, and highly manoeuvrable, the SCOTT E-SUB Sport 20 Men is equally at home on trails or commuting on hard road surfaces. It’s smooth lines and sleek black finish boast quality and performance. New for 2018 is the fully integrated 500Wh Bosch PowerTube. Sleek lines indeed! Fully equipped for leisure or business, the SCOTT E-SUB Sport 20 Men comes with a custom Racktime™ rear carrier for easy attachment of luggage. A rear rack pack is ideal as are panniers. No Velcro required! Designed for comfort and durability, the Sport 20 Men delivers exceptional performance via a strong Bosch drive. Exceptional range comes as standard via Bosch’s huge 500Wh battery. Long and leisurely escapes are what this bike is all about. 10-speed Shimano Deore derailleur gears provide smooth and precise gear changes. Shimano hydraulic disc brakes are responsive and effective under all conditions and deliver ultimate stopping power. Fitted with Schwalbe Energizer Plus 700x50c puncture resistant tyres and Sapim double butted spokes on Rodi rims, the SCOTT E-SUB Sport 20 Men is a joy to ride. Sensible and safe. Fully kitted, the Sport 20 Men has full mudguards front and rear, as well as lights. On the front and rear is a bright and luminous AXA Blue Line. Perfect visibility assured. Cabling is routed internally for tidiness. Security is enhanced through the Abus Pro Tectic Frame/Battery Lock mounted on the rear stay. Bosch’s concise and unobtrusive Purion display clearly provides all the rider information necessary and sits out of harms way on the handlebars. In summary, the E-SUB Sport 20 Men from SCOTT delivers ultra comfort and looks with a high torque motor, huge range and new integrated Bosch PowerTube.